The manager of motor racing legend Michael Schumacher says she hopes "that with continued support and patience he will one day be back with us". The seven-time Formula 1 world champion suffered severe head injuries in a skiing accident in December 2013. He left hospital in September 2014 to continue his recovery at home after coming out of a medically induced coma. 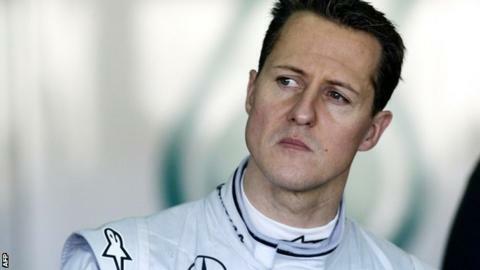 Schumacher, 47, continues to receive treatment at his home in Switzerland following the accident in France. Speaking at the opening of an exhibition of Schumacher's career in Marburg, Germany, Sabine Kehm said: "He is the most successful driver in history and sometimes, on days like this, it is good to be reminded of it. "Of course, Michael is not here and of course we miss him. We know what has happened and cannot change it. "We must accept it and hope with everything we have that, with continued support and patience, he will one day be back with us." In November, FIA president Jean Todt said Schumacher was "still fighting". Earlier this month his former boss at Ferrari Luca di Montezemolo said the latest news about Schumacher's health was "not good".